Home / TOP STORY/ Thumbs up for trade! The companies focused on several sectors including apparel, organic coconuts and spices, hotel building and business process outsourcing. These were the concrete engagements that were announced by the International Trade Centre (ITC) that was the main organiser of WEDF. ITC will track the gains made from the forum but insisted that it was the crucial opportunities given to companies to export from the conference that was more important than numbers. “Many other business decisions would likely be made over the next few months or even longer. This was an opportunity for them to meet and relationships can be forged over a longer time for many of them,” International Trade Centre (ITC) Executive Director Arancha González told reporters at the end of the forum adding that Sri Lanka has great potential for south-south trade given the trade policies adopted by the Government. “Breaking into exports for smaller companies is as important as the final investment. A study of 200 companies done by ITC has shown that over the last six years 56% of those companies have both increased and diversified their exports. For a small company even $ 100,000 or $ 200,000 in exports is a landmark improvement,” she noted. The event also received a massive thumbs up from the private sector for including their input, which they claimed was the first such effort by successive Governments. “This is the first time that a Government has included us in a forum of this nature even though we have been asking them for such an opportunity over many previous years,” said Exporters Association of Sri Lanka Chairman Fazal Mushin. “We drove this team and wanted to put the best of Sri Lanka before the world. Previously we were never heard. We were told. We want to be involved because this is about our survival and we want to take ownership of this process. We are greatly encouraged by the open door policy of the Government,” he added. State Minister for International Trade Sujeewa Senasinghe was upbeat about the opportunities before Sri Lanka and reiterated statements by Prime Minister Ranil Wickremesinghe that the Government would roll out significant investment projects once it had set the policy foundation right. “We wanted to open up engagement within the private sector. Our aim is to increase export earnings from the current $ 11 billion to $ 16 billion over the next few years, which is a very ambitious goal. We are working with ITC to create 2,000 new exporters. We have been pledged about $ 3 billion by China for various projects over the next three years and there are several other countries interested as well. So we should see a significant increase in investment at the end of next year,” the State Minister said. ITC is the joint agency of the United Nations Conference on Trade and Development and the World Trade Organization. The forum was billed as one of the largest trade promotions forums to date with hundreds of local and foreign companies participating in nearly 3,000 ‘speed dating’ sessions during the two days. This is the first time Sri Lanka is hosting an event of this stature, and the resulting export opportunities are expected to be hugely beneficial to the economic development of the country, organisers said. The forum facilitates international trade and provides a platform for open discussions on the most pressing trade issues and challenges faced across the world, especially those in developing countries. The Government is responsible for making trade possible, especially negotiating trade agreements and improving the business environment, the Executive Director pointed out, insisting that reforms to encourage exports had happened over the last six years. She stressed that the ITC had seen “significant progress” under the current Government. The ITC in a Survey of Business in 2010 interviewed 500 Sri Lankan companies and conducted in-depth studies on 200 of them, across sectors and sizes, across the country. Six years later it was redone with a smaller number of those same companies to track changes and 56% of those companies that were polled in both in 2010 and 2016 said the business environment had improved, she noted. The 16th edition of the conference was organised by the International Trade Centre (ITC) and was co-hosted by the Ministry of Development Strategies and International Trade of Sri Lanka, with the Sri Lanka Export Development Board (EDB). President Maithripala Sirisena, Prime Minister Ranil Wickremesinghe and Minister of Development and International Trade Malik Samarawickrama led the line-up of high-profile speakers. The conference featured 497 registered foreign participants and 320 local participants. From the total of 51 speakers and moderators, 39 were international speakers. The culmination of the assembly of policymakers, trade experts, trade analysts and business leaders from across the world would be to expedite export, business and partnership opportunities for Sri Lanka. 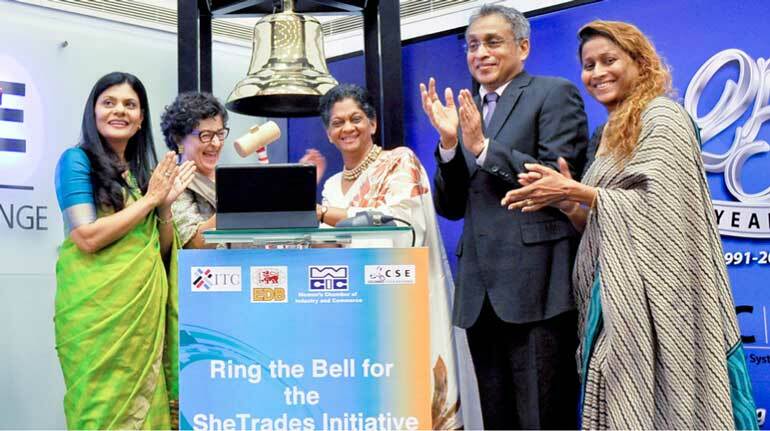 In a symbolic gesture a bell ringing ceremony was held yesterday at the Colombo Stock Exchange (CSE) to raise awareness on the International Trade Centre’s (ITC) ‘SheTrades’ initiative to link one million women entrepreneurs to the global market by 2020. The event was held under the patronage of ITC Executive Director Arancha González, International Trade State Minister Sujeewa Senasinghe, Export Development Board (EDB) Chairperson and Chief Executive Indira Malwatte, Women’s Chamber of Industry and Commerce (WCIC) Sri Lanka Chairperson Rifa Mustafa and CSE Chairman Vajira Kulatilaka. The ceremony took place in conjunction with the World Export Development Forum (WEDF) - organised by Sri Lanka and ITC at the BMICH in Colombo - which concluded on Thursday. ITC Executive Director González stressed the fact that the ‘SheTrades’ initiative is all about empowering women economically. “No country would see a growth in their economy if half of its assets are not utilised. We have done a lot of education, healthcare and politics. We must now turn our attention to the economy because it is the economy that is going to change and anchor the future education, healthcare, politics and the rest,” she pointed out. Noting that it was a global movement not centred only on women, she insisted that it was about society working in unison, men and women together, to alter stereotypes. “Every country cares about growth and the quality of the number. Make sure that in your country society, family and women are empowered economically; not because it is morally right but because it makes a lot of economic sense,” González added. The ‘SheTrades’ initiative was launched in 2015 as part of ITC’s efforts to support United Nations member states achieve Goal 5 - to empower all women and girls - of the 2030 Agenda for Sustainable Development. It aims to connect one million women entrepreneurs to the global market by 2020. “This is our collective agenda for the transformation; to get one million women entrepreneurs connected by 2020 by working in partnership with each other. If we get there faster, we will increase the numbers. ‘SheTrades’ is not only for the formal sector but for informal sector women moving to the formal sector, not about women in cities, but also women in rural areas, it is about women from everywhere and anywhere,” she asserted. EDB Chairperson and Chief Executive Indira Malwatte pointed out that although there was a considerable number of women holding high positions in the Government sector in Sri Lanka, at the Board level representation was still insufficient, which needed to be remedied through a collaborative effort. Malwatte said the EDB on its own had started a number of programs where they were working with the Asian Development Bank (ADB) to empower 500 women in the areas of ITC and food processing. CSE Chairman Vajira Kulatilaka said he strongly believed that enabling the potential of women was central to ensuring sustainable and inclusive development, both in business and the community. “In the perspective of the capital market, society needs women from around the country to come forward and play an active role investing and in managing their investments because the opportunities the capital market presents are not limited to a particular gender, race or person representing a certain background. Investment, business and the economy at large will thrive only with the involvement of people from all walks of society and with the participation of both men and women,” he expressed. He asserted that promoting the involvement of women in managing and leading businesses is important for society not only because it is the fair and right thing to do but also because it could be a key contributor to productivity and value creation. Kulatilaka also said that emerging leaders in Sri Lanka would consist of a huge wave of women making their mark over the next 10 years, especially in the areas of stock brokering and investment banking. While welcoming the ‘SheTrades’ initiative, he said the CSE remained committed to creating an environment for women to realise their potential, both at the workplace and within society. “We would therefore like to pledge our continued support to ensure gender equality and the full participation of women at all levels of society,” he noted. She said the bell ringing ceremony for the ‘SheTrade’ initiative to encourage women-owned businesses to market was a truly significant chapter in empowering women in Sri Lanka. “I reiterate that women have proven to be more adept at identifying gaps, fulfilling wishes, are more flexible and have the ability to bring in a different and most often crucial approach to decision-making and problem-solving. They are also more efficient in utilising opportunities and optimising potential. Why don’t we use them for the entire marketplace and nation?” she questioned. Igniting women to reach beyond borders and embrace challenges and opportunities, influencing women to think big, beyond and better and the transformation of mindsets, attitudes and abilities were suggested by Mustafa as future steps. Winner of the coveted Best Woman Entrepreneur of the Year of Sri Lanka, Iron One Technologies CEO Lakmini Wijesundara said it was a privilege for her to speak at the trading platform of the CSE where 70% of the listed companies were using her company’s platform for stock trading. Noting that Sri Lanka was taking more positive steps to support female leadership, she pledged to support the ‘SheTrades’ initiative. Through the ‘SheTrades’ web and mobile application, women entrepreneurs across the world are provided with a unique platform to connect to markets. ‘SheTrades’ allows women entrepreneurs to share information about their companies, expand networks, connect and internationalise. It also helps corporations include more women entrepreneurs in their supply chains.